October 18, 2014 9:00 a.m. Self guided. View fall colors from TNC Pickerel Lake Preserve. Directions: N8957 Pickerel Jay Road East Troy, WI 53120. Upper parking lot or park in a lot on Pickerel Lake Road for the South addition. 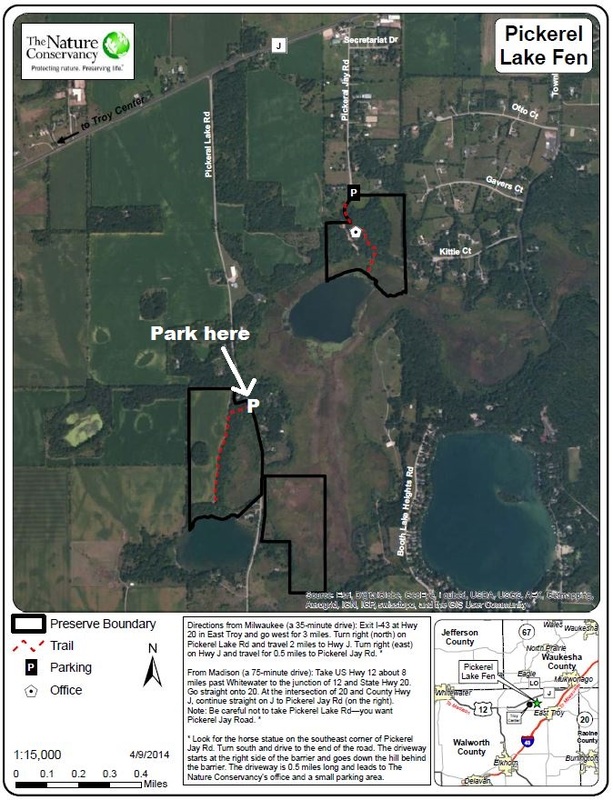 The Nature Conservancy has established its Mukwonago River Watershed project office on 40 acres located on the north side of Pickerel Lake. The land, which is largely dominated by oak openings, an extremely rare plant community, is at a high point, and there are good views of Pickerel Lake. The fen itself is located south of Pickerel Lake and is a fragile environment. Pickerel Lake Fen South addition, this 55-acre parcel combines wetlands adjacent to the Pickerel Lake Fen, 18 acres of mixed hardwood forest and a 25-acre crop field that eventually will be returned to native prairie. From the lot, visitors can walk uphill to a dirt drive that leads south. The drive divides the ag field from the woodlands and takes hikers to a trail that leads down to Willow Pond, a 25-acre impoundment that forms the southern headwaters of the Mukwonago River. Bring binoculars to perhaps catch a glimpse of bald eagles and osprey that live in the area as well as waterfowl that stop over on the pond. Make sure to wear blaze orange because this part of the preserve is open to hunting.